Most jellybean op amps will be able to keep the VCC/2 voltage stable as long as the connected load is kept low enough. Max load (max output current) is specified in the op amp data sheets. However, most op amps don't like driving capacitive loads. Best to avoid hooking up caps to the VCC/2 directly to be safe and make things easier. It is possible to stabilize the VCC/2 buffer by adding freq. specific compensation inside of the feedback loop, but it gets somewhat complicated. And in those cases it might be easier to use a proper +/- supply anyhow.. I also designed a voltage controlled exponential LFO for a pedal recently. Was quite tricky to get right. But it is certainly doable. 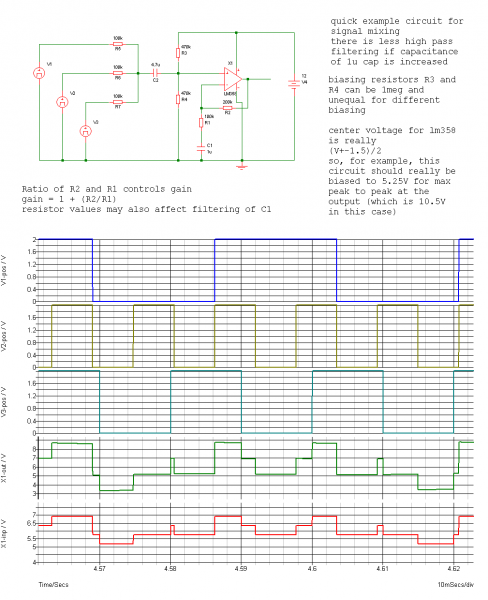 Try a google search for "single supply op amp design" for some great design reference PDFs. @jonasjberg Analog be harder than digital. What I forgot to say in that last post is that the LFO had a mixer stage which could combine the trianglular and square parts of the output (actually ramp and pulse really, since the rise/high and fall/low parts of the waveform could be individually controlled). It was at the mixer stage that I was having the problems, which as I said, I now think I can understand. With both mixer controls in the "off" position, I didn't get the expected straight line on my scope, but a slightly "wobbly" line, deviating at the oscillator frequency. I'll add this to my little list of things to do (which keeps getting longer...). Great link on the VC/2 op-amp stuff. I could read through that over and over. It's a great quick check for heaps of things. Long live the 4.7uF input cap! I strive to make all my circuits work from a single supply so I do a lot of biasing to V+/2. You can add biasing to your signal at the non-inverting input then a feedback network to the inverting input, with a capacitor to ground ... I better do a diagram, this will not amplify the biasing and amplify only the signal. However this introduces more high pass filtering than I like so I just adjust the biasing if it is convenient to do so. You're making up for lost time today Jingle Joe! I have seen circuits like the one you've shown, but I was unsure as to how they worked exactly (hence I tended to stick to the inverting amp). I'll have to give this a try sometime. I have messed around with non-central reference voltages, usually because I wanted a set range of control voltage outputs but you need to be careful it doesn't swing too far one way or the other (and flatten out). Also, some op-amps work better than others, depending on the max/min voltage outputs it can produce (i.e. the output swing voltages). As an aside, what software did you use to produce the schematic & simulation and does it cost any money? I can afford reasonably cheap software, but I prefer free! I can see why too, it;s free and brilliant and the diagrams are industry standard. Brilliant! I'll give it a go. Thanks again. Ok, so why does this circuit work for me then? I've had no problems with it. Also, if somebody would throw up a corrected schematic of how this circuit should look, I'd like to see it (all the +V/2, Vr, 1/2+V stuff has me confused a little). Also would be curious to build it and compare to the mixer I have. Regarding a corrected circuit: This design has worked flawlessly in my large lunetta in which I've created many a soundtrack from. Never had a problem with this mixer and stand by it in its original state. Please read how the author gets virtual earth in his mixer designs in the link provided above. Here's a pic of one of my mixer "modules". In this case I used a TL074 and the baby is loud and proud. Probably a "fair cop" there Draal. I think that we all jumped to the conclusion that it shouldn't work without actually trying it. It is an unusual circuit, but that doesn't mean it can't work. I will try it out sometime, just for the record. No worries, I'm an odd duck so I gravitate to the "goofier" schematics. I am in the process of finishing up another lunetta and I'm at my mixer stage so I will doing a more typically biased single supply mixer. I have bread boarded both my original version and the modified one and got similar sounding/performing mixers. However i'm inclined to agree that the mixer didn't fuss much due to only square waves being used. For my particular setup, it works. 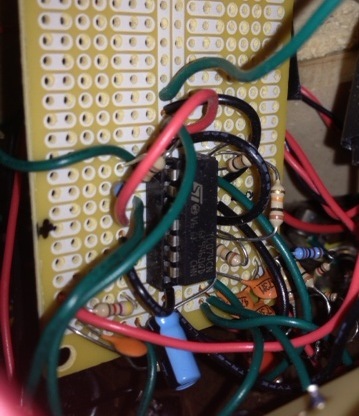 But systems running voltages other than on/off square signals should follow your updated version of the mixer I posted. Updated for clarity and respect. I rather liked your "magic smoke" comment on the original post! I'm a little bit "once bitten, twice shy" on relying on smoke (or at least the smell of hot semiconductors). For a TL082 (etc) it's not too much of a biggie, but when I first started playing with LM13700s, I seemed to be destroying them with (fairly) costly regularity (until I actually read a data sheet and found that 2mA is the maximum amp bias current ). I still have one that works on one side and not the other, but I don't know if it's safe to use the working part. I know that LM13700s are outside the Lunetta category, but if anyone knows the answer to that, I'd be interested to hear from them. Looking back, I think this mixer was the first module I made for my Lunetta. Our 2nd child was due within a week or so and I was trying to get my lunetta up and running before the Diaper Wars started. My schematic reading and assumptions were suspect at best during that period (you could still make that argument ) . And yes, I do edit from time to time when I find my humor is not as funny the second go around. I believe the mixer Draal posted (with the op-amp power pins being V+ and Gnd) works fine because the input signal only swings between V+ and Gnd. Op-amps don't like input swings that go outside the range of their power supply. Nothing to do with the square wave shape itself. It's only when your input signal swings above and below ground that your mixer op-amp needs a dual (+/-) supply. I now know why this is (and I've remedied it), but the thread has rolled on. I'm not complaining, as it's all educational to me but (I think) that's why the square wave references might still be appearing here. I appreciate any inputs on the subject.